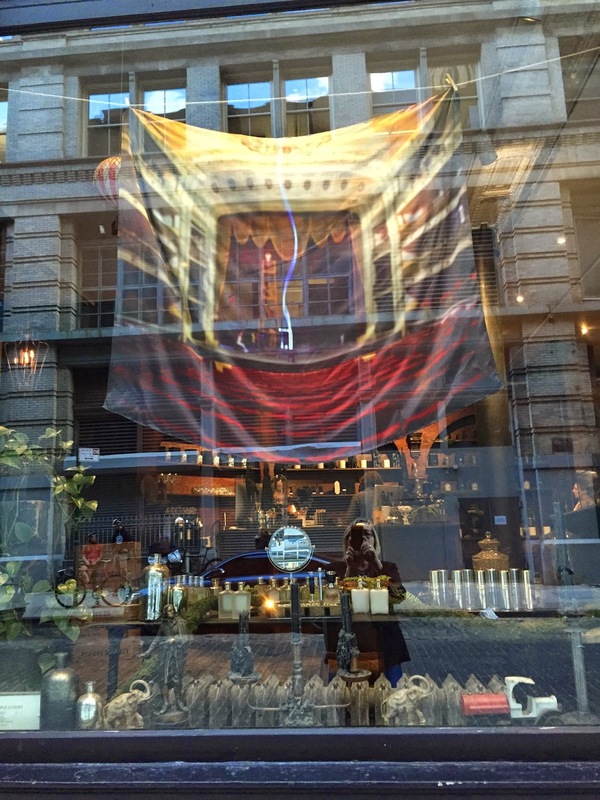 if you've been reading this blog for some time, you know that i love perfume. i've always been a pretty mainstream perfume kind of girl and admittedly, most of my scents have been acquired through the years in the duty free shops of airports around the world. 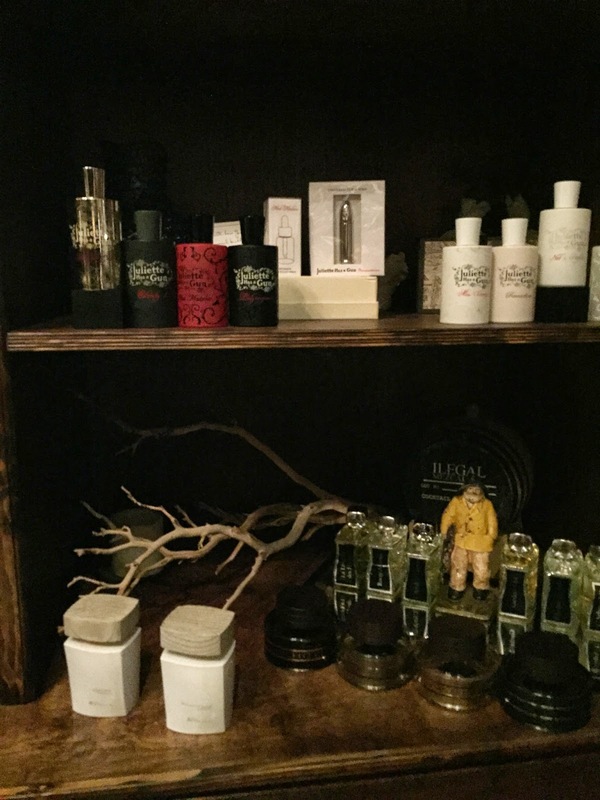 my sister has a good friend who is a scent aficionado and she has sent my sister to small, esoteric shops in paris after some amazing, exclusive scents. 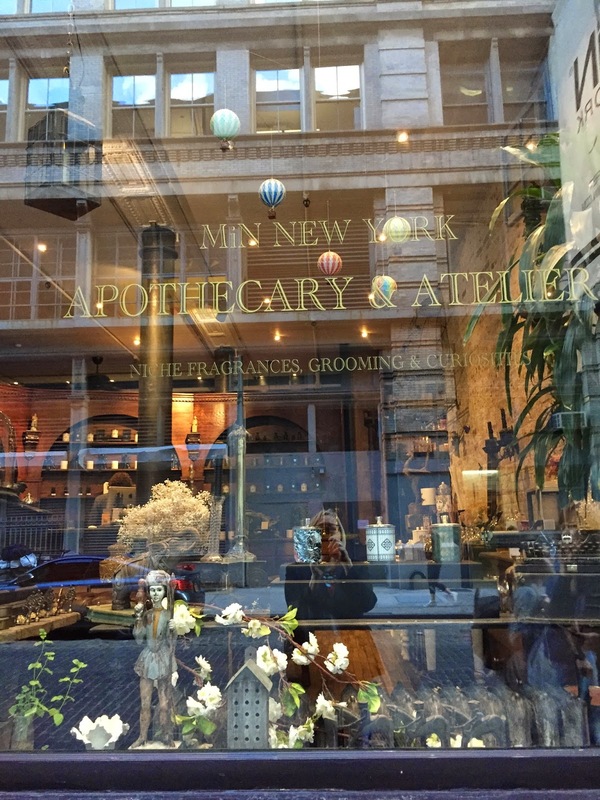 so it was no surprise on my recent trip to new york city, that monica had a couple of perfume places on her list. we lost quite a lot of one day of her stay (we won't say why, but a late show at a comedy club and a cheap bottle of wine on top of oysters and foie gras might have had something to do with it), so we chose to visit just one of them - MiN new york in soho. just peeking in the window of this beautiful shop made me quiver with intimidation. if my sister hadn't been there, i don't think i'd have dared to go in on my own, thinking the experience and the prices would be far above me. i expressed a bit of that intimidation when i came into the dark, warm, richly scented interior, but the people in the shop very quickly put me at ease - one was the president of the company, an attractive guy with longish hair and a cool manner and the two sales girls, with their exotic accents and easygoing, totally not snobbish manner. they quickly made us feel welcome and as if it was exactly our kind of place. i realized very quickly that i could get used to niche fragrances. in addition to a lot of exciting niche scents from around the world, they have their own line of what they call scent stories. there are 11 chapters to their scent story book, each with their own personality and heady fragrance. we tried only three of them (your nose can't really take that many more) and we were also trying some of the kerosene scents (more about them in another post). my sister fell in love with one called magic circus, which the folks a MiN describe as: "Turn of the century, a carnival travels at dusk. A scrumptious gourmand perfume. A splendid wonder swirling in enchantment. Candied nuts, cotton candy, caramel, sprinkled with pink peppercorns, bergamot, labdanum, geranium, patchouli, and woodchips." 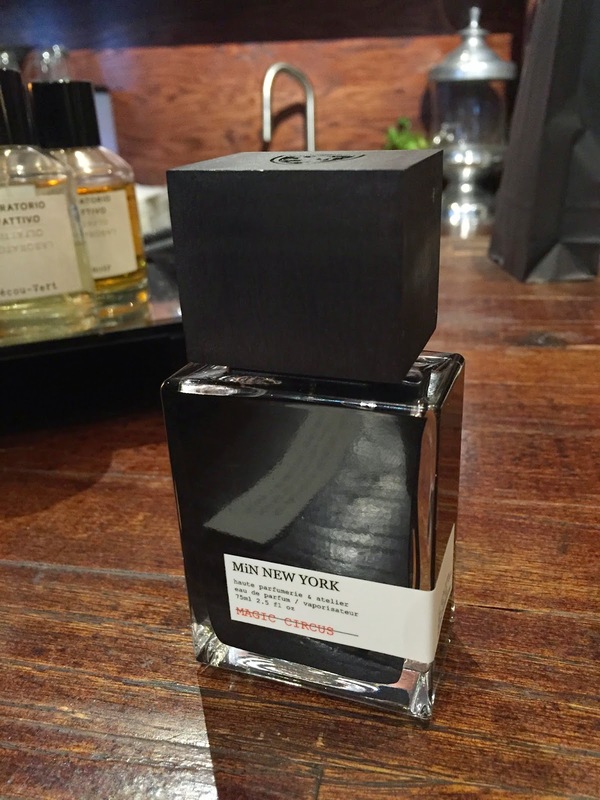 all of which rings scrumptiously true in the complexity of the scent. it smelled wonderful on her, but less so on me. it was obvious that my sister needed the magic circus and she serendipitously got bottle number 72 (of 1000 - they only make 1000 of each of the scent stories per year), which is both the year of her birth and her lucky number. it was meant to be. i went away with samples of memento and barrel, as my skin chemistry can be temperamental with perfumes and so i need to see if they go bad on me over several hours (when that happens, it isn't good, believe me). and in the end, tho' i had decided that i loved the barrel most, but was chickening out on going all the way back down to soho and spending $240 on myself, when my sister called and said, "can you get back to MiN by 6 and pick up your barrel, i've just ordered it for you." i couldn't believe it and told her not to buy me a christmas present for the next five years. but i also jumped on the subway and headed to MiN immediately. there was a film being made on the street right outside of MiN, so i didn't have quite the same slow, drawn-out experience i had when we had visited together, but that was ok, as i wasn't in the market for more scents right then anyway. i did grab a sample of barrel to send to my sister so she could test it out as well. my bottle of barrel is #86 of 1000. as the MiN folks say of barrel, "Evident in the first sniff, a slight floral opening gives way to bold, beautiful notes that we taste in full-bodied dark spirits and wine. Peaty, smoky, smooth, and earthy, this is the scent of the selfless vessel that rest in halcyon, incubating the finest spirits throughout the years. A complex cocktail of spirits, spices, dirt, tannin, and woods: absinth, coriander, pink pepper, rum, myrrh, orange blossom, tuberose, oak, oak moss, leather, vanilla, patchouli, and vetiver." in other words, deep, dark heaven. and i would love to go back and try some of the other scent stories. i have a feeling my book of scents in nowhere near complete. Labels: couture perfume, MiN New York, my sister, perfume snob, posh, what are you gonna remember? I love perfume, but I've never been inside a perfume store. How can you smell an individual scent when so many have been opened in the store? evrything ok .. Julie .. never happened with such a long blogstop .. Your sister is awesome! What a perfect Christmas gift for you. ooh. i think i need to go smell that place. kerosene: which one(s) to buy?